Jacob M. Schlesinger reported on Tuesday at The Wall Street Journal Online that, “Eleven Pacific Rim nations agreed to forge a new trade bloc [TPP] that excludes the U.S. on Tuesday, as President Donald Trump signed an order to block certain cheap Asian imports [Chinese makers of solar panels and South Korean producers of washing machines], illustrating the battle lines of a new global trade climate. It will be hard to convince allies that ‘America First’ goes beyond isolationism and protectionism. The risk is that other countries retaliate against American producers with their own sanctions and step up new trade accords without the U.S. Meanwhile, Bloomberg writer Shruti Singh reported on Tuesday that, “After six consecutive days of weather-driven price gains, the rally in soybean futures in Chicago almost came to a halt Tuesday. One explanation may be the tariffs on imported solar panels and washing machines announced by President Donald Trump a day earlier. 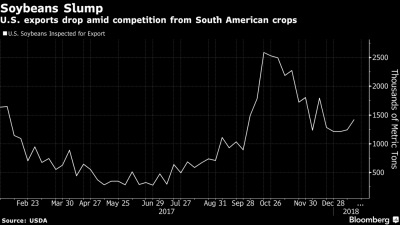 “Soybean Market Gets Jittery About China After Trump’s Tariff Move,” by Shruti Singh. Bloomberg News (January 23, 2018). “‘NAFTA is moving along pretty well. I happen to be of the opinion that if it doesn’t work out, we’ll terminate it,’ Trump said in the Oval Office as he signed orders imposing tariffs on imported solar panels and washing machines [see video clip above]. Sen. @PatRoberts emphasizes at @SenateFinance hearing that the U.S. cannot "pull the trigger on the termination" of #Nafta. He says he's spoken to Trump and "I don’t think that’s going to happen." Meanwhile, James Q. Lynch reported last week at The Gazette (Cedar Rapids, Iowa) Online that, “Add U.S. Sen. Joni Ernst’s voice to those who believe that President Donald Trump is reassessing his position on the North American Free Trade Agreement. The Gazette article explained, “Ernst, who was among a group of GOP senators who met with the president to discuss NAFTA before Christmas, said Trump was under the impression they wanted him to pull out of the agreement with the countries that are the United States’ and Iowa’s largest trading partners. “However, when Trump polled everyone at the meeting, Ernst said only U.S. trade representative Robert Lighthizer supported withdrawing from NAFTA. President Donald Trump has come to see that Nafta has some benefits to the U.S., particularly for farming, even as he stays firm in his demand for a new deal, Agriculture Secretary Sonny Perdue said. 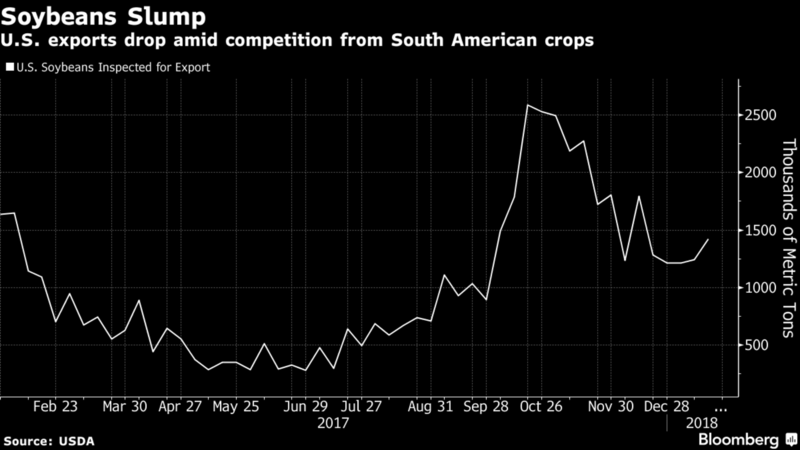 And Reuters writers Jason Lange and David Alire Garcia reported on Tuesday that, “The [NAFTA] stakes are high for the U.S. poultry sector, which exports products worth more than $1 billion a year to Mexico. Mexico could slap a 75 percent tariff on U.S. chicken and turkey under its commitments to World Trade Organization rules, compared to the 20 percent tax on imports the Latin American nation could apply to other major U.S. exports like pork. 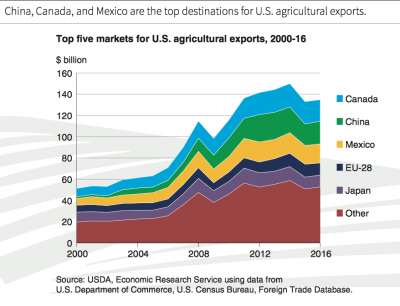 Today’s update provides a brief overview of updated USDA agricultural export data, and also looks at recent news items regarding the NAFTA renegotiation, with particular focus on perspective from some farm state Senators. As he did last January in Nashville, President Donald Trump addressed the American Farm Bureau Federation’s Annual Convention in New Orleans on Monday. Today's update highlights news reports surrounding the President's appearance at the convention.